This rather long post begins with a reflection on my teaching methods for my first and second year courses on Old and Middle English literature at University College, Oxford. I then introduce the context and background for my experiment of using twitter with my second year students to engage creatively with Chaucer’s Troilus and Criseyde. the carpet pages of the Lindisfarne Gospels. Focusing on the material culture of a text’s production and period is an important part of my own research (see the post about my work on The Book of Margery Kempe and devotional objects here) and I think that it’s important that students think about texts as part of the range of practices that a culture employs, from building churches to going on pilgrimage, producing visual art to staging dramatic performances. In my second year teaching this term, I have been working with my students on Chaucer’s Troilus and Criseyde. In their final exam, the students have to write a critical commentary on a passage from the poem so they need to know the poem and its style in considerable detail. My colleague Jenni Nuttall (@stylisticienne) has produced some invaluable resources for Troilus commentary, from her Reader’s Guide to the poem to the Poetics Primer on her blog. I frequently make use of both in my teaching. 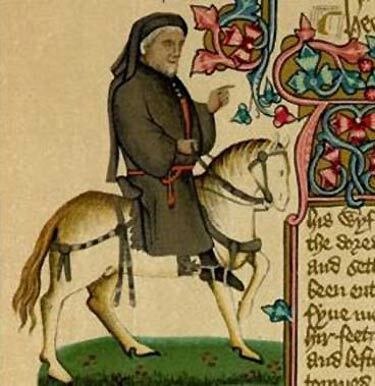 One of my primary strategies for helping to students to engage with the poem and become familiar with it over the term, is my Chaucer Reading Group. The group was inspired by my undergraduate experience at Durham when my tutors ran a similar group and allowed eager undergrads to take part. It was a real pleasure to read through the Canterbury Tales with Corinne Saunders, John McKinnell, and David Fuller, all of whom read with skill, passion, and good humour. I realise now that it was a formative experience for my thinking about how to engage students in medieval literature. Reading Troilus with my second years is always a joy and it is wonderful to see how the students develop their readings as we go through the term and look in detail at the narrative as it unfolds. Reading aloud has a number of advantages. Students gain a better sense of the pace of the poem. The dramatic quality of the dialogues between characters comes to the fore (in previous years we have experimented with dividing the roles between students- one will read Criseyde’s lines, one Troilus, one Pandarus, and one the narrator). The poem really comes to life when read aloud. We’ve simultaneously laughed at and recoiled from the exchanges between Pandarus and Criseyde. We’ve been frustrated with Troilus’s courtly excess but sympathised as he waited for Criseyde’s promised return. We’ve watched with a mixture of anticipation and fear as Criseyde has fallen in love with Troilus and then, inevitably, betrayed him. Reading Troilus aloud is always one of the highlights of my term and I always notice new things about the poem in collaboration with my students. This term, in our final reading group, I decided to experiment with using twitter in my teaching of the poem. As many of you know, I am something of a twitter-addict! It’s a wonderful way of connecting with medievalists in the field and I’ve had a number of fascinating twitter conversations that have made me think about texts in new ways (talking about The Book of Margery Kempe as ‘fan fiction’ with Kathryn Maude, for example). So for my last reading group, I decided to ask my students to come up with twitter-handles, tweets, and hashtags for Troilus and Criseyde. As this was motivated in part by a desire to allow the students to think creatively and freely about the poem, I didn’t set detailed parameters but if I was using twitter as an official in-class activity, I would think more carefully about this next time (Mary Flannery reflects on the importance of having a plan in her article on ‘Teaching with Twitter’: ‘social media needs to be clearly relevant: students need to know why they are using it and what they will get out of it’, p.4). I told my second years that our use of twitter was experimental and they were happy with this (and for me to blog about the results). So, what did my students come up with? The students also thought about other characters who would be tweeting. The goddess Fortune was a particular favourite, with suggested twitter-handles of @wheelerdealer, @hotwheel, @slipperywheel reflecting the image of Fortune’s wheel in the poem. In our classes we frequently discussed A. C. Spearing’s view of the narrator of Troilus not as a character but a ‘sequence of narratorial first-persons’ (quoted in Nuttall, Reader’s Guide, p.6), so one of the students suggested that the narrator would tweet from @Spearing_fan. One student thought that Criseyde’s father, Calchas, who betrayed Troy and defected to the Greeks might tweet as @ILoveGreece. Another student thought about the envoy in Book V when the narrator dismisses his book (‘Go, litel book, go litel myn tragedye’ V:1786) and suggested that @litel_bok might tweet as follows: ‘Tehee, off I go! @Virgil @Ovid @Homer @Lucan @Stace’ The tweet reflects how Chaucer dismisses his book and sends it to follow in the footsteps of his great classical auctours, as a twitter-user might tweet ‘at’ other users, hoping for a response. Book I, Troilus falls in love and Pandarus resolves to help him. Troilus tweets a cryptic message encouraging Pandarus to contact him (cf I:416-7 winds of fate from Canticus Troili). Pandarus replies asking for Troilus to ‘DM’ or direct message him, the tweet highlighting the role of secrecy in the affair. In Book II when Criseyde is beginning to fall for Troilus, Pandarus then tweets the image of the ruby in the ring with a winky face emoticon (II:585), alluding to the troubling nature of Pandarus’s role as go-between in the poem. Book V, Criseyde is tweeting from the Greek camp and Troilus responds bitterly. When we discussed hashtags, we thought that all the characters would be following the #TrojanWar and that if personal tweets were also tagged with the Trojan War, it would replicate the way in which Troilus and Criseyde’s affair takes place in the context of the war. In the course of our classes we discussed Criseyde’s concern for her ‘honour’ and reputation, and what the public might be saying about her. The students suggested that #jangle might be used to tag the gossip about Criseyde (in Middle English ‘jangling‘ covers spiteful gossip, idle chatter, tale-telling, quarrelling). In the poem the narrator uses it in Book II when Criseyde has fallen for Troilus (‘Now myghte som envious jangle thus: / ‘This was a sodeyn love’, II:666-7) and in Book V Criseyde uses it when she is trying to convince herself that she will not listen to ‘wikked tonges janglerie‘ (V:755) and she will return to Troy. One of my students, Jess, produced a brilliant twitter profile for Pandarus (thank you to Jess for allowing me to share it here!). For the twitter-handle she chose ‘@PuppetPandy’, foregrounding Pandarus’s role in orchestrating the affair between Troilus and Criseyde. For his profile description, she had Pandarus describe himself as ‘lover of proverbs, dab hand at matchmaking’ and gave him a website that highlighted his voyeurism in overseeing the affair. The top trend was ‘#IHateTheGreeksBecause‘, reflecting the Trojan War context. Pandarus used #tresoun when questioning whether Criseyde would return from the Greek camp, which tied in to our discussions of betrayal in the poem (Calchas betraying Troy and his daughter when he defects to the Greeks, for example). Troilus was tweeting as ‘@onlyfoolsfallinlove’ and Diomede was ‘@babemagnet’. Criseyde was ‘@ThatGirlCriseyde’, emphasising her public prominence. In the tweets, Jess wanted to highlight the passage of time, in particular the time that has elapsed since the beginning of the affair and Criseyde’s betrayal (Chaucer extended the time frame from his source, Boccaccio’s Il Filostrato- Book V:8-14 begins by telling us that three springs have gone by since Troilus say Criseyde in the temple in Book I). In her presentation, Jess talked in particular about the final tweet in which Pandarus tweets Criseyde, ‘I kind of hate you btw, lol.’ This refers to Pandarus’s final speech in the poem in Book V when he declares to Troilus, ‘I hate, ywis, Cryseyde; / And, God woot, I wol hate hire evermore!‘ (V:1732-33) We had considerable debate about this speech in class (whether we felt that it was justified, why Pandarus would resort to such a severe condemnation of his niece). With the use of ‘lol‘, Jess wanted to explore the ways in which statements on social media can be undercut or defended as a joke if they are followed by ‘lol’ or a winky face, making the author’s intention difficult to discover (and of course ‘entente‘ is a key word in the poem, especially concerning Criseyde). One key theme in the poem that proved difficult to replicate on twitter was the secrecy of Troilus and Criseyde’s affair and the importance of keeping it out of the public eye. With twitter being such a public platform, it is unlikely that Troilus and Criseyde would tweet about their love for each other! We also discussed the moments when Chaucer gives us access to Criseyde’s thoughts and then reports her speech. If Criseyde was tweeting both her private thoughts and public utterances, this would replicate our reading experience as of course we have access to both, but the characters within the poem do not. We also discussed the complexity of tweeting from Criseyde’s perspective in Book V once she is in the Greek camp. 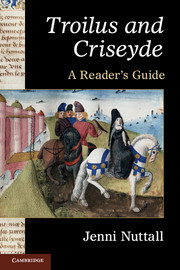 Barry Windeatt comments that one of the effects of the narration in the final Book is that Criseyde ‘slips ever further out of focus’ and that the ‘reader’s baffled sense of ‘losing’ Criseyde in the narrative shares in the bafflement and pain of Troilus himself’ (Troilus and Criseyde, p.288). I really enjoyed my creative twitter experiment and I would certainly consider making use of twitter in other classes in the future, perhaps with a focus on student writing in addition to creative outputs. Mary Flannery reflects that twitter improves student writing as being confined to 140 characters requires students to be precise and focused, especially when tweeting the argument of an essay (Flannery, pp.6-7). If I used twitter again I think I would do this kind of activity as I often find that students can struggle to articulate the central argument of an essay and breaking it down into five tweets, for example, might be a helpful way of establishing their basic premise in stages. Thank you to my second year English students at Univ for participating in this experiment and allowing me to quote from their work: Jess, Jennie, Seamus, Ben, JH, John, and Alex. Thank you to Mary C. Flannery for letting me read her article. This entry was posted in Uncategorized and tagged chaucer, reading aloud, social media, teaching, troilus and criseyde, twitter. Bookmark the permalink.